The area between Nottingham Station and intu Broadmarsh will no longer be dominated by traffic, providing a better experience, environment and road safety, with reduced noise and air pollution for all. New shops, businesses and restaurants will create a vibrant, revitalised city centre destination. In recent years the redevelopment around the train station area has improved Nottingham’s standing as a destination city for shoppers, commuters and tourists. A better Broadmarsh will help to extend the reach of this new gateway into the city, welcoming visitors who walk up from the newly refurbished station towards the Old Market Square and beyond. They will be greeted by a vibrant, modern, pedestrian friendly space, filled with cafes, restaurants and shops. Instead of walking and enduring a maze of tired 70s era buildings before the ‘real’ city centre is reached, the intention is to extend the city centre southward so visitors are instantly welcomed to Nottingham. A revised road plan is essential to making this vision a reality. Our plans to reduce the dominance of traffic on streets south of intu Broadmarsh follow earlier successful schemes which have dramatically improved the city centre and helped it remain a destination that attracts visitors. It is almost impossible to imagine the Old Market Square as anything other than a pedestrian oasis at the heart of the city – but it’s not so long ago that the streets around it were clogged with traffic. The rebuilt Broadmarsh travel centre will be a hub for all forms of transport in the city. Connecting the tram, local and national buses, easy access to the train station, cycle corridors and a new-and-improved car park. However you chose to journey to Nottingham, a better Broadmarsh area will help improve your journey. Rerouting traffic from around the city will not only make a more pleasant environment for city centre users, but will make journeys more straight forward for car users. The northern stretch of the inner ring road of Maid Marian Way and Parliament Street was ‘tamed’ around a decade ago. Anyone who remembers what an unwelcoming barrier they used to create, including their uninviting subways, would agree that the ease with which we now get from the Old Market Square to the Castle or the Royal Centre, for example, is much improved. It is now time to transform the southern section of the inner loop road. Drivers for whom the city centre is not their final destination will not be forced to enter a web of one-way systems, four lanes of traffic and constantly stop for pedestrian crossings. 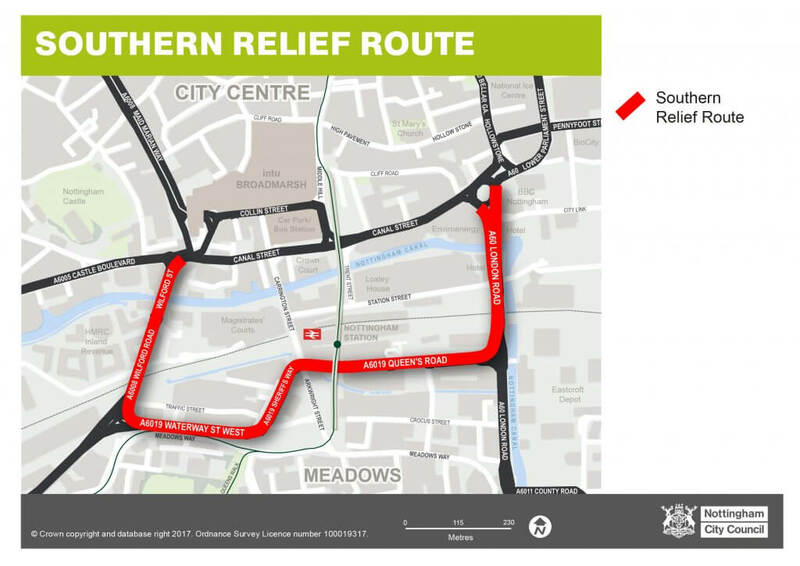 Instead, the new southern relief route will become the primary link for east/west journeys and improve traffic flow by avoiding the city centre. This route taking drivers from the London Road roundabout south on the A60, along Queen’s Road, Sheriffs Way, Waterway Street and Wilford Road has been designed to ensure that this layout is as efficient as possible. We know it will be difficult for some people at first, and will provide information and directions for those who are unsure. We hope to ease the transition and improve journey times, and have worked towards this by adding extra capacity on London Road and installing the ‘red route’ to help keep traffic moving. Double red lines along this important east/west route show that there can be no stopping at any time, and should ease congestion. Pedestrianising Collin Street and Upper Carrington Street will make the biggest change to the atmosphere of the area. It is hard now to imagine cars driving down Albert Street past Marks and Spencer or around Old Market Square. In time this will be how we view the Broadmarsh area. This new pedestrian friendly space will welcome visitors who walk up from the newly refurbished station, from the tram, bus or new car park towards the city centre and beyond. Canal Street will be used to enter the new-and-improved Broadmarsh Car Park and for access to homes and businesses along the street, including the new £60m City Hub. The section of the road from under the tram bridge to the connection with Castle Boulevard will be for cyclists and buses only. 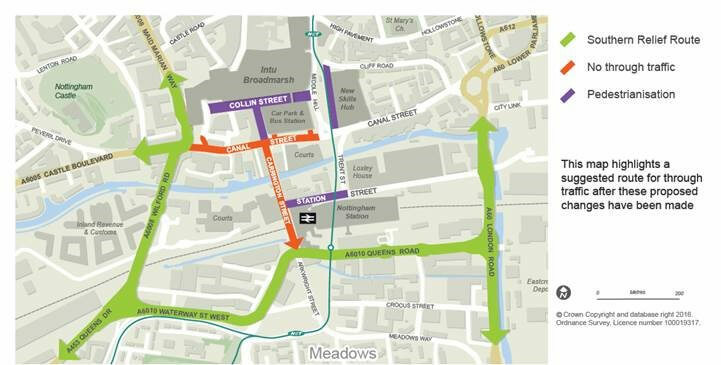 The flow of traffic on Greyfriar Gate will be reversed, diverting traffic from its previous route on Collin Street towards the new inner ring road. Connecting traffic from Maid Marian Way to routes west and south. These changes will steer buses towards the newly revamped Broadmarsh Bus Station and direct cars in the right direction out of or around the city. The design of Middle Hill is conscious of the changes to the wider area, with priority for pedestrians to be able to move around the new Broadmarsh area and into the new cinema at intu Broadmarsh. Students at the new City Hub will have easy access to what the new Broadmarsh area has to offer, linking neatly to the new pedestrianised Collin Street and transport options at the tram and new Bus Station. The regenerated Broadmarsh area will have no direct cost to the tax payer. The redevelopment will be funded using a combination of grants, inward investment, prudential borrowing and income from the new shops, car park and potentially residential in the new Car Park building. In time, the new centre will pay for itself and other council services by generating £1.1 billion to Nottingham’s economy over the next decade and creating nearly 3,000 jobs. The new centre will attract more visitors and encourage them to stay longer, particularly with the £25m redevelopment of Nottingham Castle on the horizon – figuratively and literally – alongside the rest of what Nottingham has to offer. Find out more information about planned roadworks associated with the Broadmarsh development. 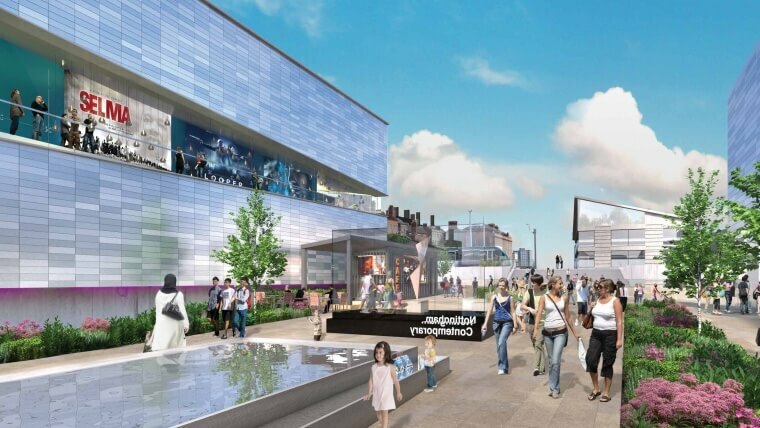 Find out more about the Broadmarsh Redevelopment project.